In a cold March morning I felt quite exited. I was on my way to the Sofia airport. I was going to start my first journey to Asia. 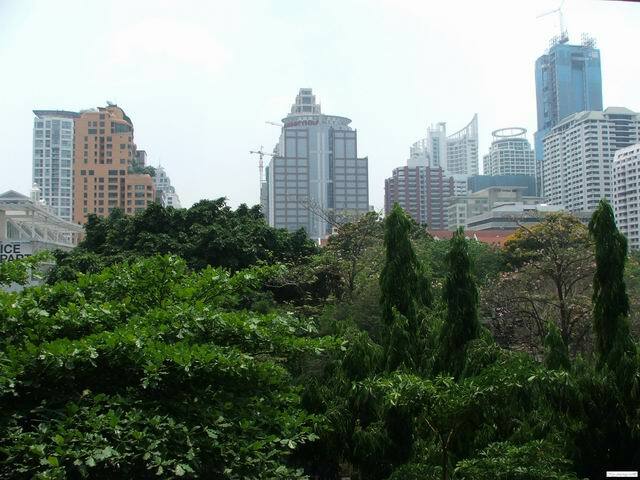 My destination was Bangkok, Thailand. 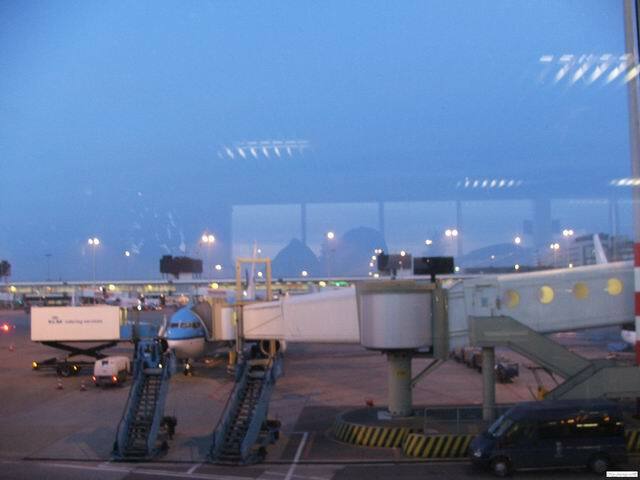 So I caught a plane to Amsterdam, stayed at the Schiphol airport for about 11 hours and took another flight to Bangkok. I arrived there at noon on 6th March. The weather was much warmer that the one in Bulgaria. It was a sunny day and the temperature was about 30 degrees. A friend and an ex-classmate of mine met me at the Suvarnabhumi airport. His name is Andy. He works as a model and he is a co-owner of a model agency. We loaded my baggage in a car and we headed towards his apartment. 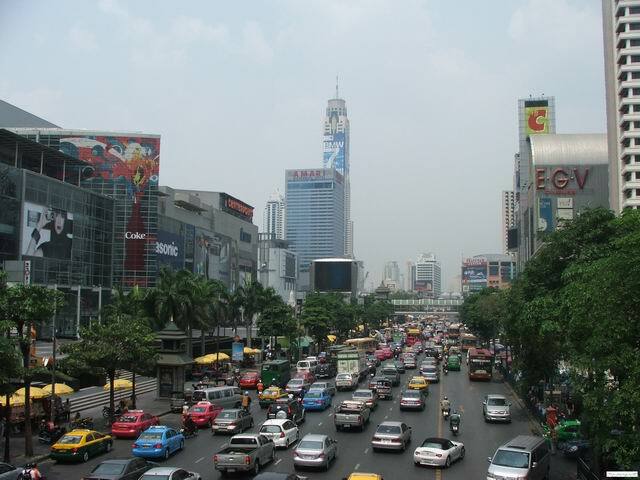 The first thing which makes an impression in Bangkok is the traffic. Although the roads have several lanes in each direction, it is quite heavy. However, I guess this is normal for an enormous megapolis with a population of about 10 million people. I have the impression that Bulgarians drive quite crazy, but at least we use car indicators when we want to make a turn or to change the lane. The Thai drivers do not give road to anyone and change the lanes without signaling for that. To be honest I am scared to drive there. It was very strange that for 12 days in Thailand I have not noticed a single car accident. There are so many lucky drivers :). We reached the Andy’s apartment in about 30-40 minutes and he left for work. 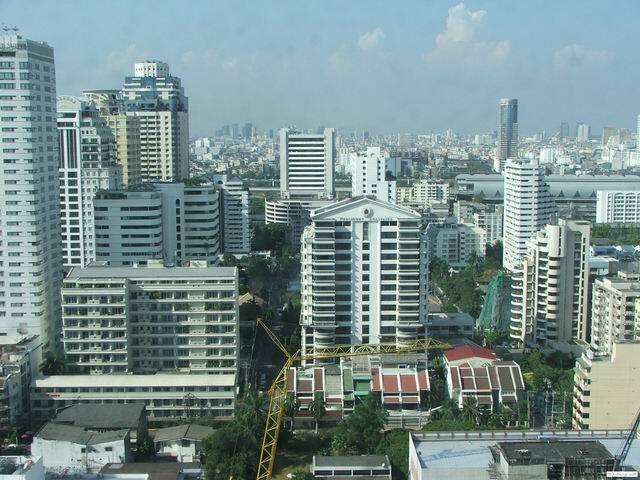 He lives in a nice apartment in a 47 floors building near to the Sky train line on the Sukumvit road. I took a shower and went to check the swimming pool on the 14th floor. This was a nice way to chill after the long flights from Sofia to Bangkok. In the evening I met the Andy’s girlfriend Isika and then we all had a Thai dinner in a small restaurant. After that we went to one of the fanciest clubs in Bangkok – Bed Supperclub. There was an Uk Dj performing and the place was quite full. After a few drinks we went to sleep. My friend had to work on the next day. 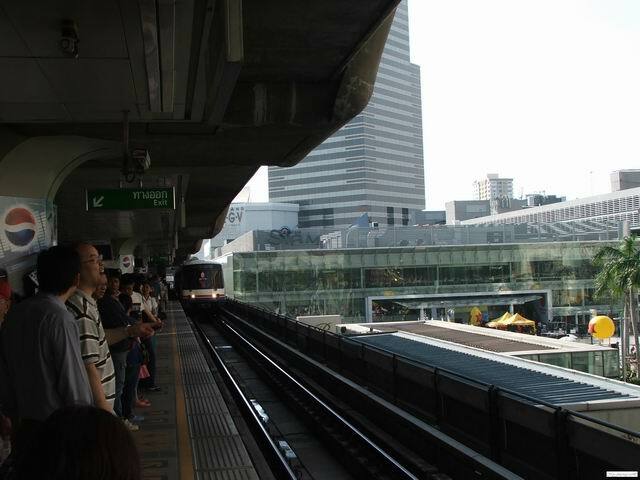 Luckily there is a sky train station near to his place. It is a quite comfortable and fast way for transportation. Also, it is affordable. Using it you will not have to stay in the traffic jams. 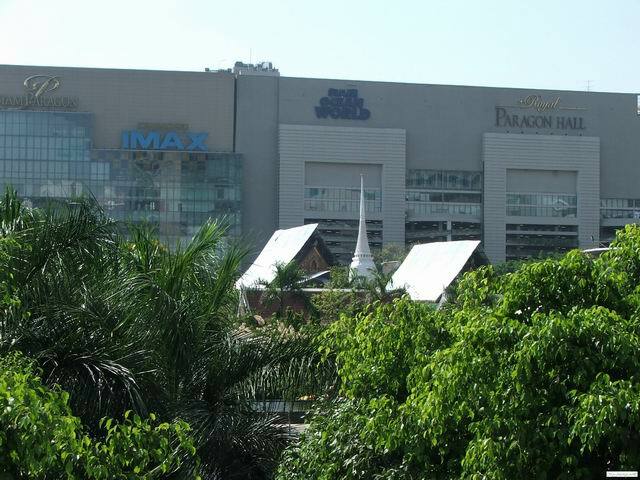 So I went and took a train to one of the biggest malls in Asia – Siam Paragon. 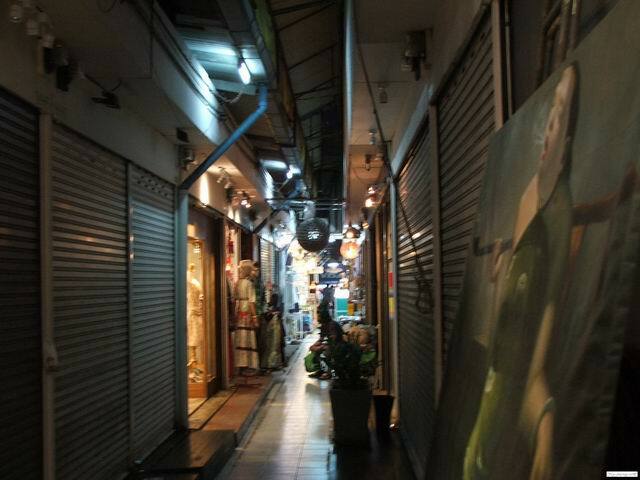 It is easy to get lost in the great variety of stores. When you get tired you can have a nice meal in one of the many restaurants located on the first floor. 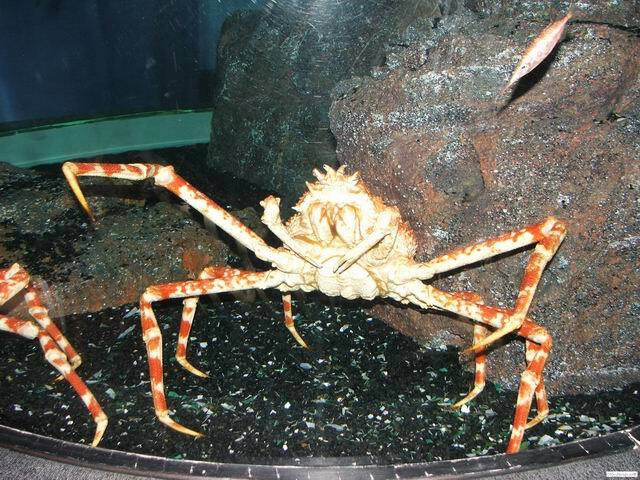 Also, in the basement you can visit the Siam Ocean World aquarium. 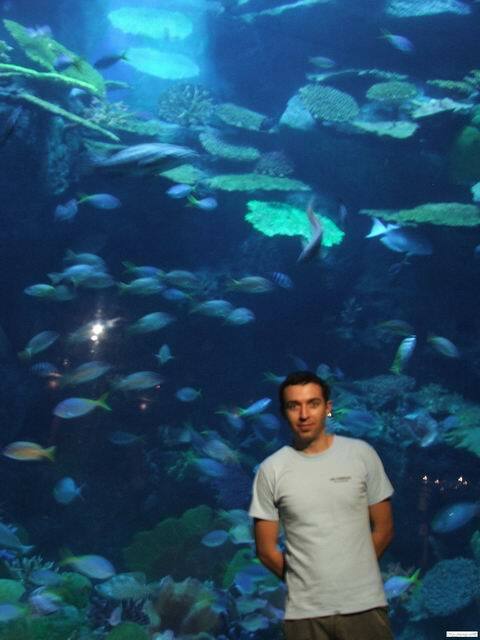 I have personally spent several hours in the aquarium on the fifth day of my Thailand journey. In the late afternoon, after spending a couple of hours in Siam Paragon I visited the model agency office. My friend was waiting for me there. We had a late lunch in a nice Thai restaurant located in the same building. To be honest in the beginning I was not a big fan of the Thai food, because it was too spicy for me. But I was curious to try many different meals. Actually I have found most of them really delicious. 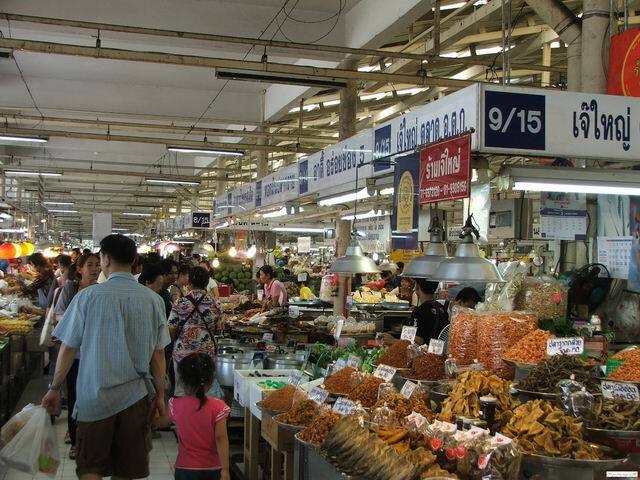 After the lunch we went to see a night market in Bangkok. There were many different goods offered in small shops. You can find clothes, jewelery, replica of popular watches, some art, furniture and souvenirs. There you can even make a photo of some exotic animals like lemurs. After the shopping we went to a bar, called “Cheap Charlie’s”. It is a wooden structure located on a quite street. This bar is quite famous among the foreigners. There we met people from different countries. A polite German guy who worked as a pharmacist for Bayer in Japan was chatting with us the whole evening. 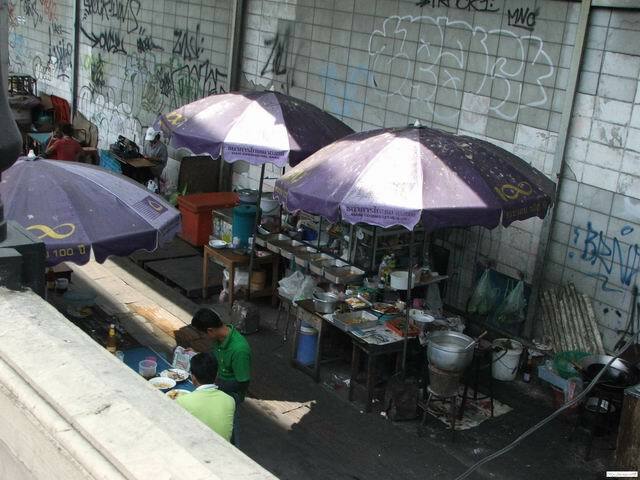 He told us that he had visited Bangkok many times and one of his favorite bars was “Cheap Charlie’s”. You can try many different drinks in the bar and the prices are quite good. Although they do not serve food, you can order a meal from one of the Indian and Mexican restaurants down the street. It will be delivered for you in the bar. After pleasant conversations with some interesting interlocutors we decided that it was time for sleeping. On the next day we woke up in th early morning. 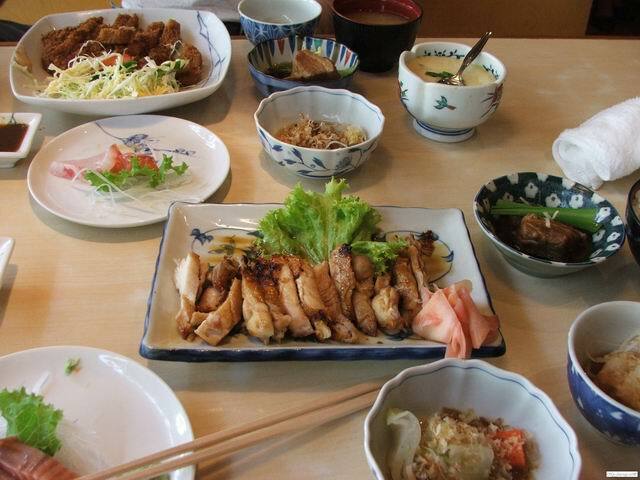 At noon we went to a Japanese restaurant. We had a delicious lunch there. After this we headed towards the Chatuchak Weekend Market. At the evening we went to play bowling in a cosy hall. 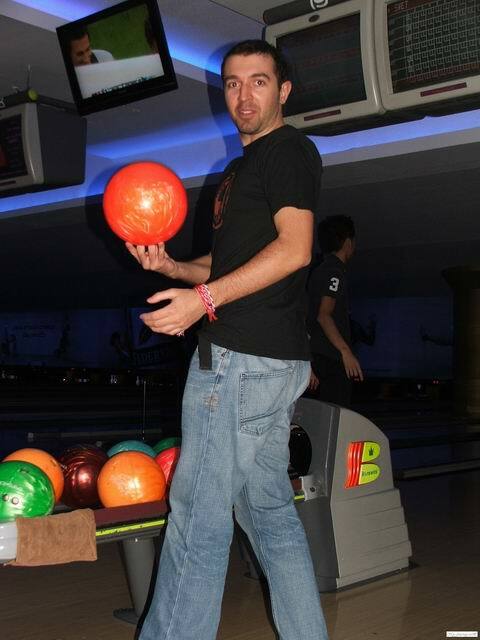 I have to admit that am not very good at this sport, but in the second game I was near to the win. However, the Andy’s girlfriend, who seemed to be more experienced than me, took the first place. After the bowling, about midnight we had a nice party in her apartment. We were celebrating the Andy’s birthday. This day I planned to visit some places of interest. It was time for some culture. 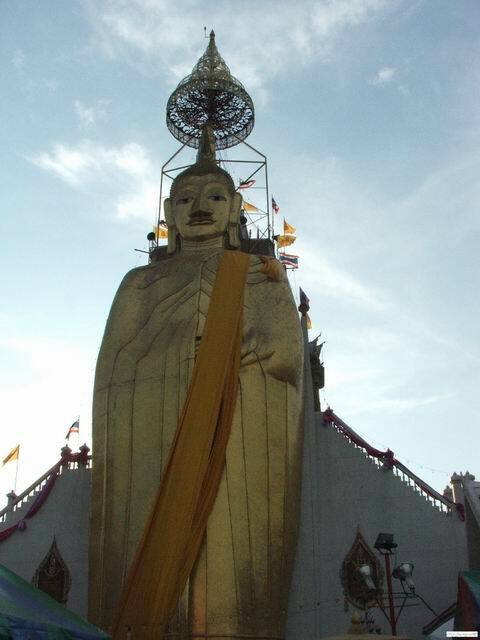 As you probably know the most popular religion in Thailand is Buddhism. 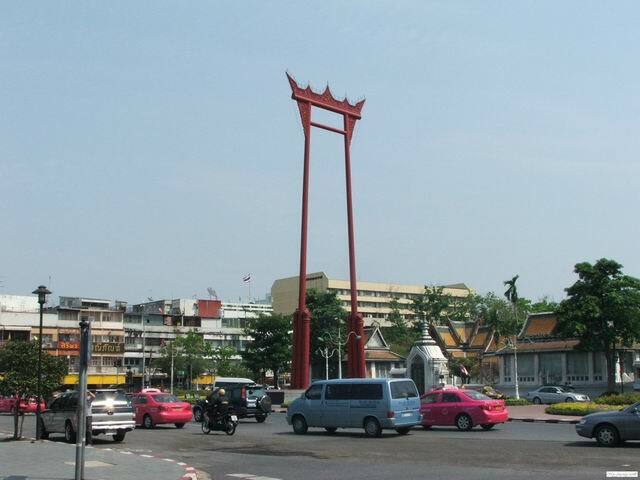 Bangkok is famous with the Buddhist shrines. They have rich decorations and they look very beautiful. Thus I decided to check them. I took the sky train and then a tuk-tuk cab. It looks like a rickshaw, but it has an engine. When you take such cabs you should be careful. I learned a good lesson that day. 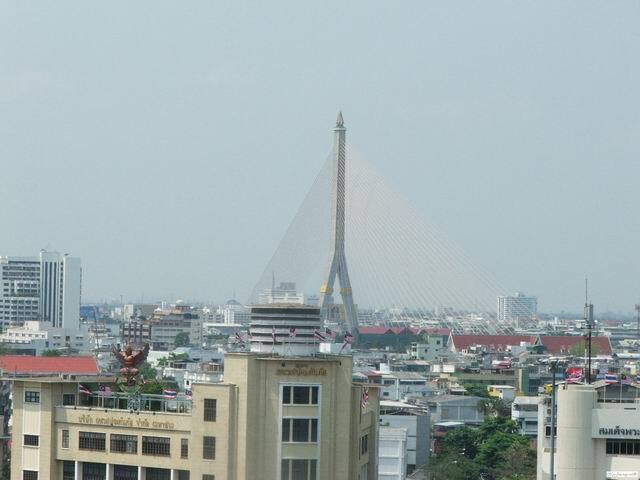 I took it from the Siam sky train station to the Grand Palace and the Emerald Buddha temple. The tuk-tuk driver charged me about 120 Bath (1euro = 45 Bath). Later I understood that if you negotiate with them, you can get a cheaper fare. I did not realize that I could not get in the temple with short pants. Thus I had to rent a pair of sport pants for 100 Bath. They keep 50 of them as a deposit and once you leave the place, you can get them back. After having a more appropriate outfit I entered the temple complex. There were many statues and scenes on the walls from the Buddhism religion. The temples are very visited by foreigners. 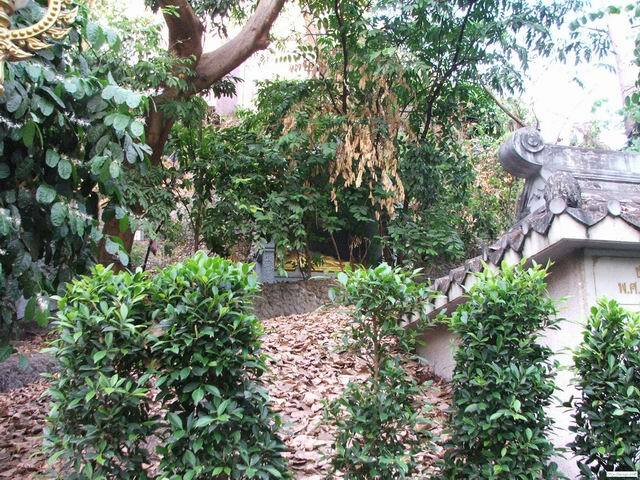 Also there you can find some exotic plants and fishes. After two hours of walking around the temple complex and taking many nice photos I decided to leave the place and continue my cultural exploration. A local person used my map and explained me how to reach some less popular temples – the one of the Lucky Buddha and the one of the standing Buddha. 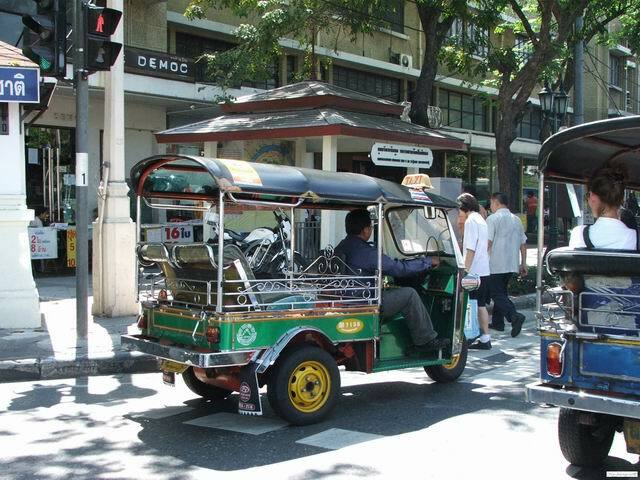 He even caught a tuk-tuk driver for me and told him where I wanted to go. 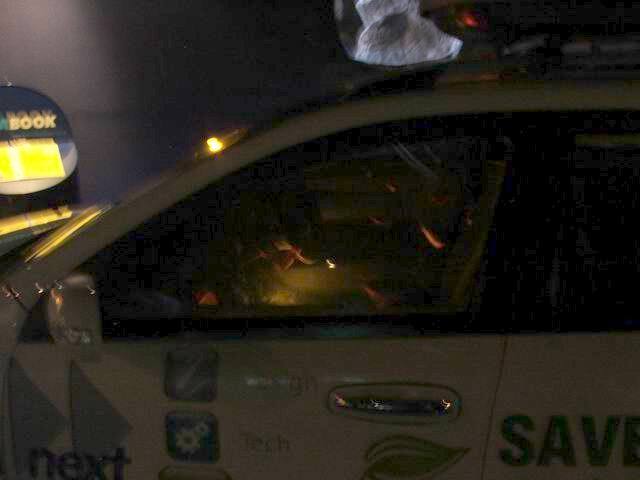 I felt really grateful for the help, but it was the time for a unpleasant journey with a local driver. First he wanted to know where I came from. I explained him that I am a Bulgarian. Obviously he was not sure where is my country, so I asked him if he liked soccer and the Manchester United team. He said that they were really famous in Thailand. Then I mentioned the name of Dimitar Berbatov – the new star in my favourite English club. Finally he was satisfied with my answer. We reached the Lucky Buddha temple. He said that we would wait for me in the tuk-tuk cab. So I went to see a really small temple with one not very large Buddha statue inside. At the door a local man stopped me and explained that during the week they had some federal holidays and many promotions for tourists. 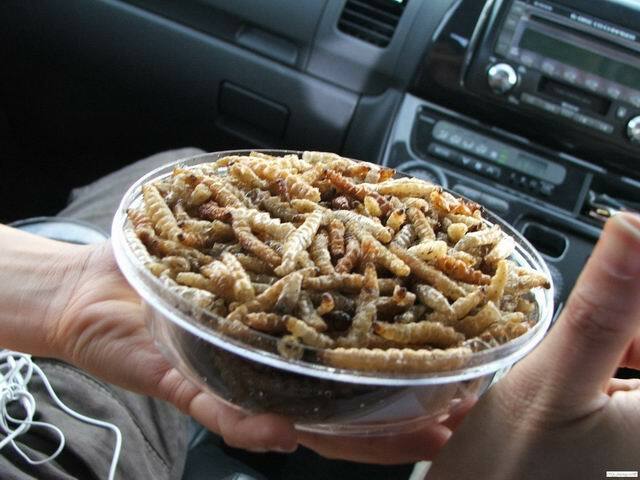 The Thai government supported such an activity. They offered jewels with sapphires and rubies twice cheaper that in Europe. Also, you could find a suit or a nice shirt with a great discount. He said that the jewels were sold with a certificate and you could make a profit selling them in Europe. I was not sure whether this person was honest, because some people told me that the locals explained this to the tourists all the time, but it was nice chatting with that man. I took again the tuk-tuk. The driver asked me to go to a jewelery shop so he could get a coupon for gasoline. I decided to be polite and to do him this favour. So I went to this shop. The sales persons inside were very kind, they explained me that the sapphires and the rubies were gathered in Thailand and thus the offered prices were very good. 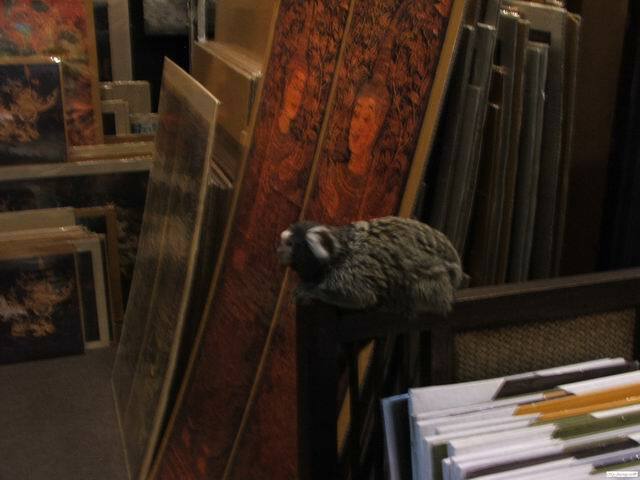 However, once they understood that I did not have an intention to buy, they lost their interest. Then the driver asked me to visit some more similar stores and my mistake was that I agreed. He promised that he would take me to the standing Buddha temple afterwards, so I decided to help him getting more coupons for gasoline. Once we visited several stores for jewels and souvenirs we stopped in front of a big tailor shop. I entered it without an intention to buy anything. However, after 30 minutes of a persuasion from one of the tailors I decided to pick a nice looking shirt from a Hugo Boss catalog. The tailor took some measurements, I picked the cloth and paid 800 Bath for the shirt. The tailor told me that the shirt would be ready on the next day and they would deliver it. After this we left for the Standing Buddha temple. The tuk-tuk driver understood that I bought a shirt. After we reached the temple, he left me without an explanation to get his commission. I checked the temple, but then I was lost. 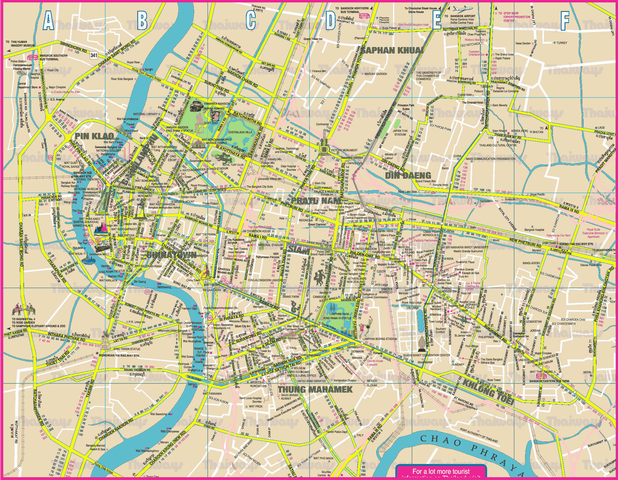 The map was not good enough, since there were only the major streets visualized on it. I met more lost foreigners. At last I found two really nice girls, who offered to take me with another tuk-tuk to the next temple in my plan. I accepted their offer. Unfortunately, the last temple in my day plan was closed. I made some photos of the area. The sunset was near and I decided to find my way back to my friend’s place. I asked many people for directions and at last I found one who knew English pretty well. He explained me which bus to take in order to reach the sky train station. Nobody in the bus spoke English, but somehow they managed to explain where to get off the bus. 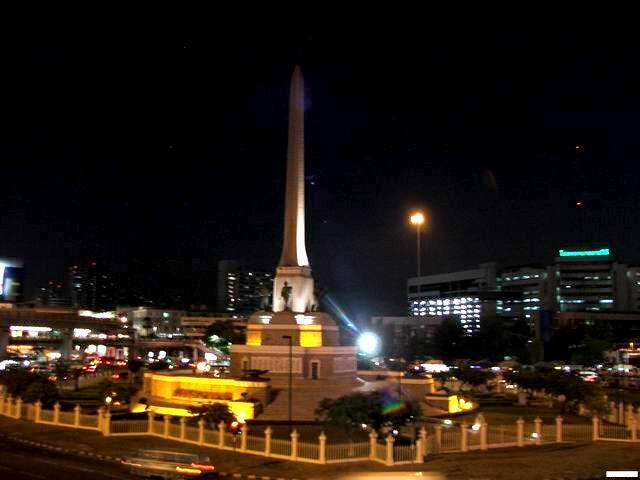 I stopped at the Victory monument and took the train. I was finally on the correct direction. I had a nice dinner from a local restaurant, which was delivered to my friend’s place. I was so tired that after watching a movie I fell asleep. 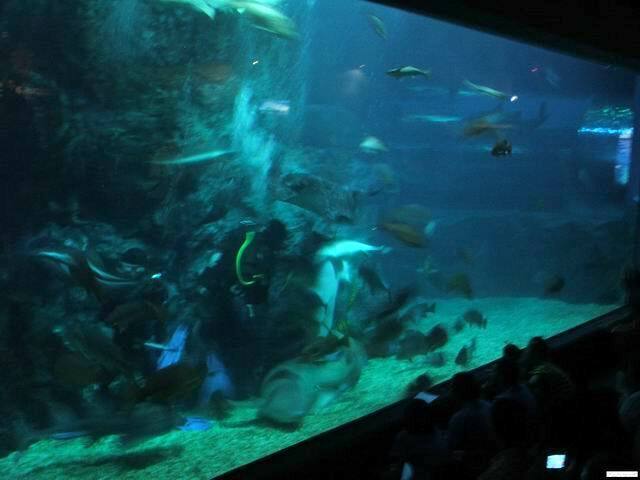 On the next day I decided to go to one of the biggest aquariums in Asia – Siam Ocean World. 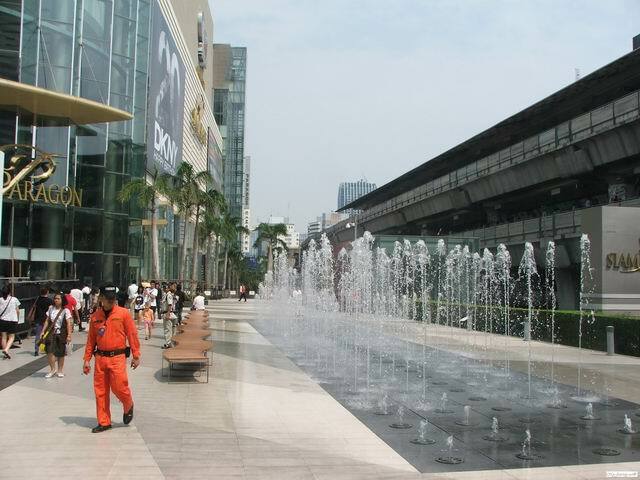 It is located in the basement of Siam Paragon. 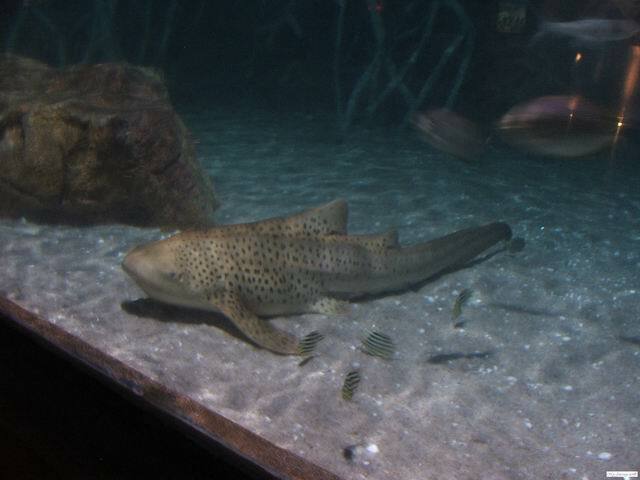 It is the home of about 400 different marine species. The coverage of the area is near 10000 square meters. Few years ago I had visited Sea World in San Diego. This one was much smaller, but I was still exited to see all the different creatures from such a close perspective. I was at its entrance at noon. The price for an adult foreigner is 850 Bath. I paid it and then I was ready to explore the ocean secrets. 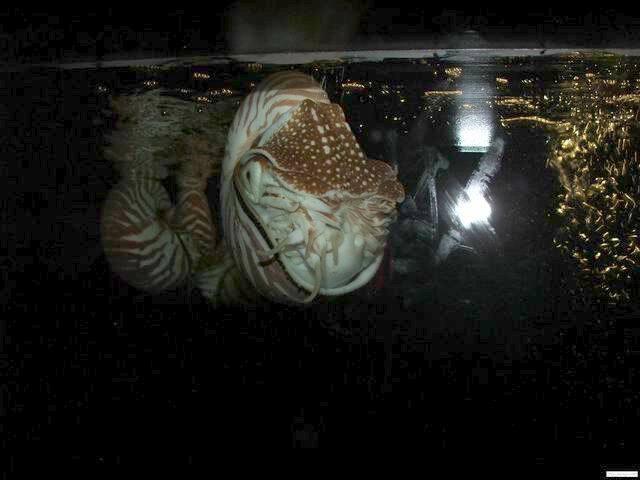 First I checked various kinds of small fishes, crabs, shrimps and nautiluses. 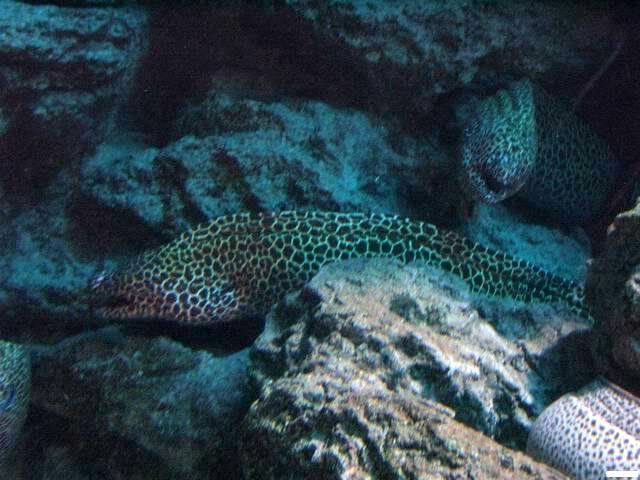 Next I stopped in front of aquariums with different kind of eels. Some of them looked pretty scary. The next stop were the ocean reef fishes. They were so colorful. You can watch them for hours and just feel astonished from the way the nature have painted them. 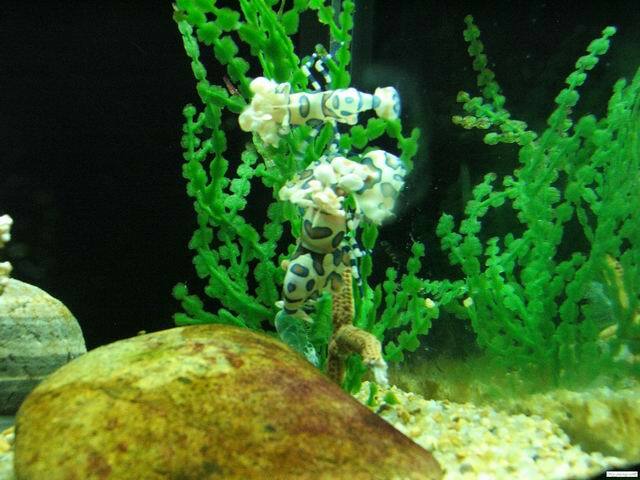 The main heroes of the “Finding Nemo” movie were chasing each other in their water home. 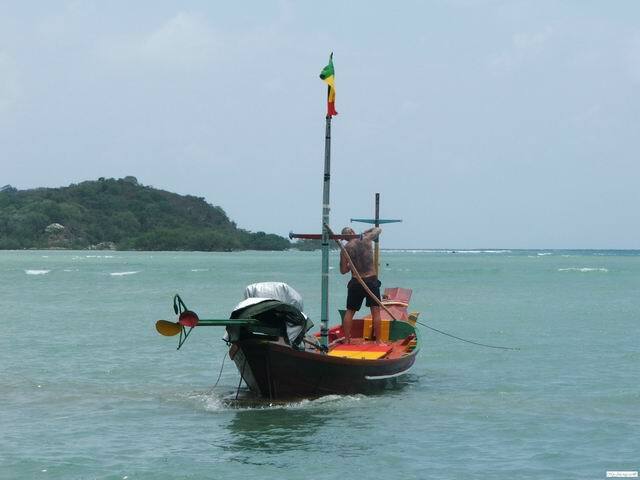 At the end of the first passage there was a car full of water and small marine inhabitants. 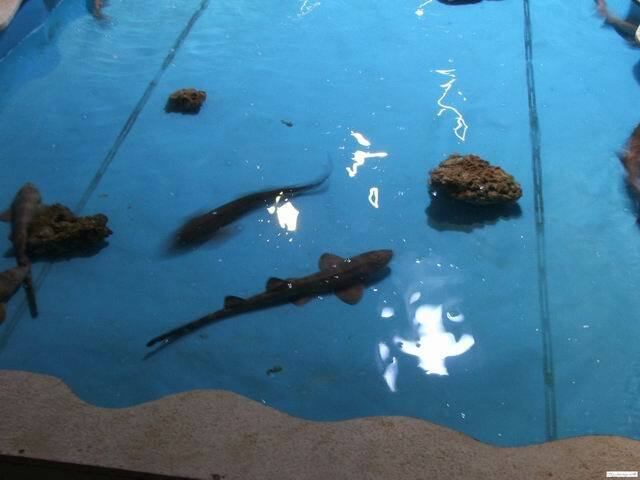 Besides it I found a small pool with baby sharks. They looked so cute. The label above them said that they should not be touched or fed because they were just fragile babies :). 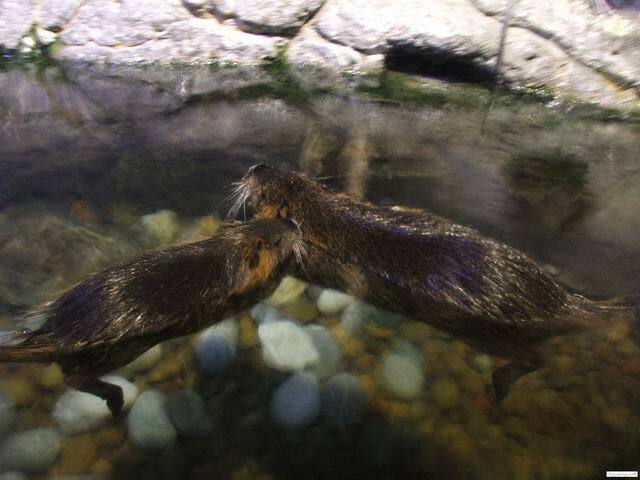 Next I saw some rare creatures with expensive fur – nutrias and otters. They looked save in their inhabitation, protected from the poachers. 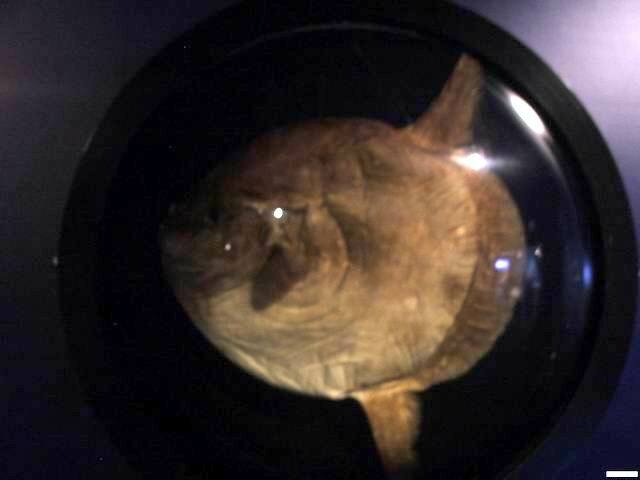 The next passage was dedicated to the fresh water creatures. Most of them are leaving in big Asian rivers like Mekong. 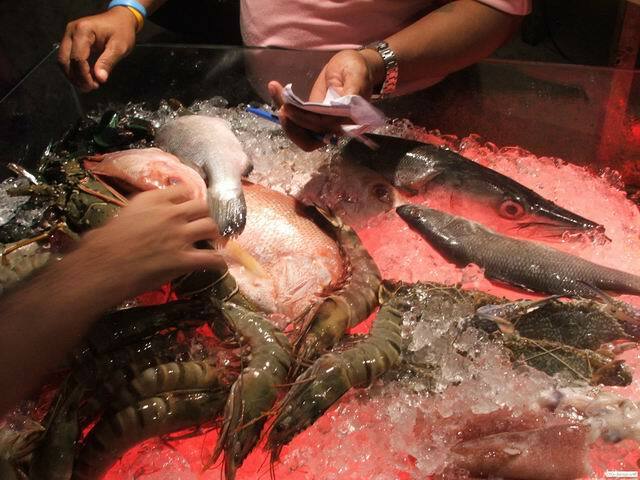 Among all the fishes you could notice the Giant Catfish, which is one of the biggest fresh water species in the world. The last passage was my favourite one. 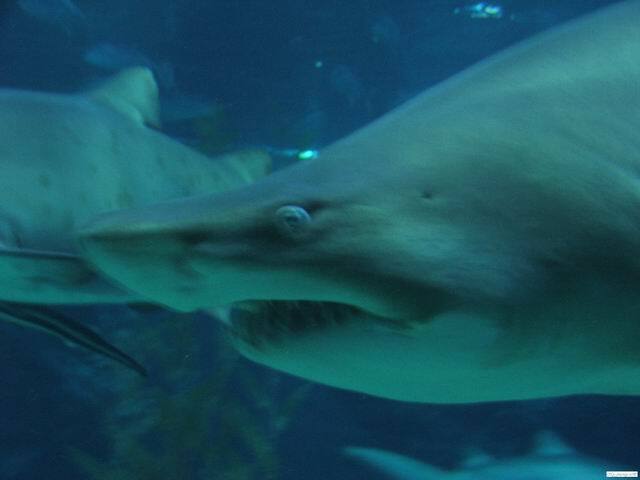 I spent a lot of time impressed by the beauty and the strength of one of the most perfect predators in the world – sharks. I managed to see the feeding of these dangerous species by some brave divers. Besides the sharks I noticed some stingrays. At the end of the exhibition I saw very rare and strange looking dead animals, which were stuffed. Some of them were not even classified. I left the aquariums at the late afternoon. I was really glad spending some time there. In the evening we visited some clubs and bars like Flix and Fashion caffee. They were popular among the models. There I met a lot of people and had nice conversations. A good thing about being a model in Bangkok is that you can visit the fanciest clubs without paying an entrance fee and in some of them you can have drinks for free. In th early Wednesday morning, after some parties, my friend and I went to sleep. The next day started with some walking in the malls. I was looking for an wireless IP camera for my sister, but I could not find any. Most of the sales consultants in the electronic shops did not seem to know anything about such cameras. At last I found one, but it was very expensive. The funny thing about the electronic mall was that there were people chasing you and offering you some pirate DVDs with the newest movies. You can not see such behavior even in Bulgaria, although few years ago we were punished by some European Committees for intellectual piracy. After this mall I headed to another one where different clothes stores were located. During my way I crossed a poor looking neighborhood. When I thought that I got lost a local woman showed me the correct way besides the river. I managed to reach the other mall and I spent some hours wandering there. 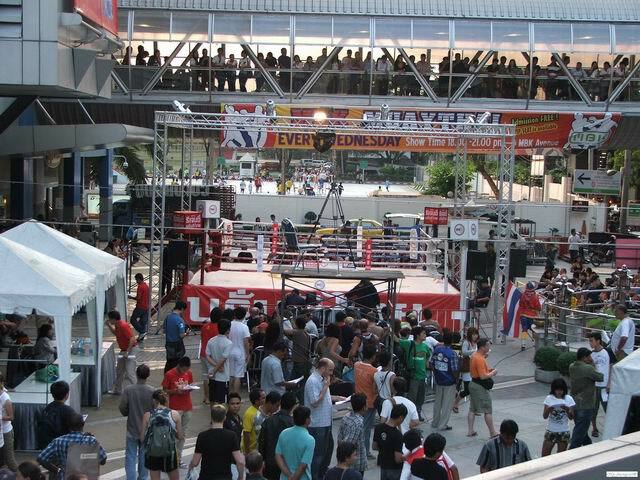 I left it in the late afternoon and I saw a ring for Muay Thai just in front of the major Bangkok malls. I get the programme of the event. 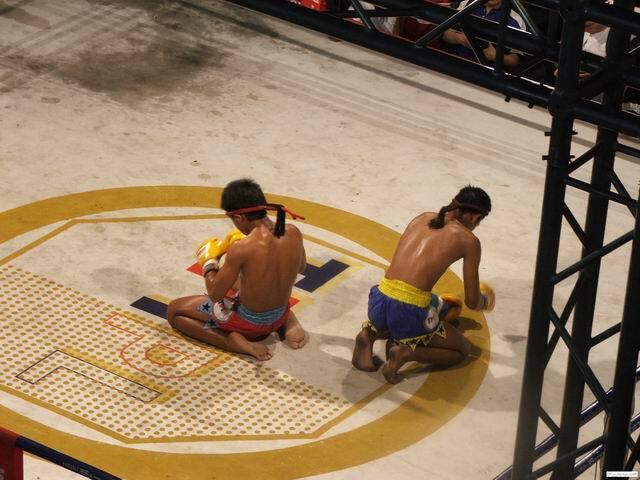 It included a demonstration of traditional Muay Thai techniques and 7 fights. The girls who made the demonstration were quite good. 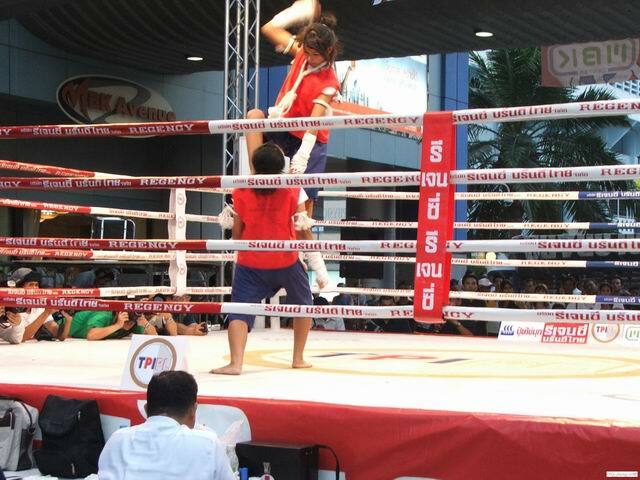 They showed some rare kicks and punches, which can not be seen in a real fight. Once they completed their entertainment the real fights started. Every fight starts with a kind of ceremony during which the fighter expresses his gratitude and respect to the gods and to the opponent. Most of the fights ended with knockouts. 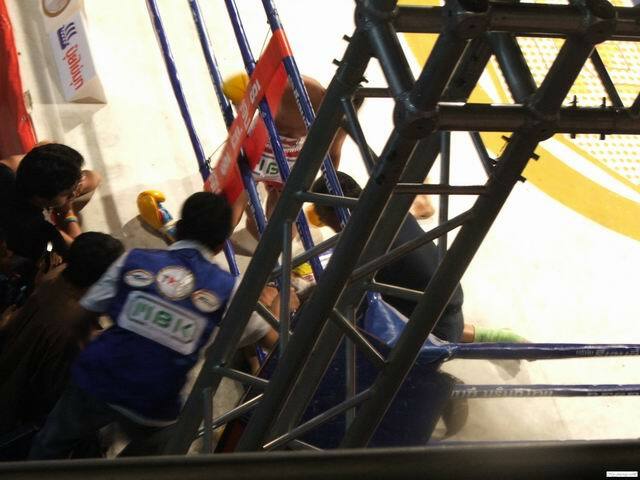 Some of the loosing fighters went unconscious and their coaches needed some time to get them up on their feet. 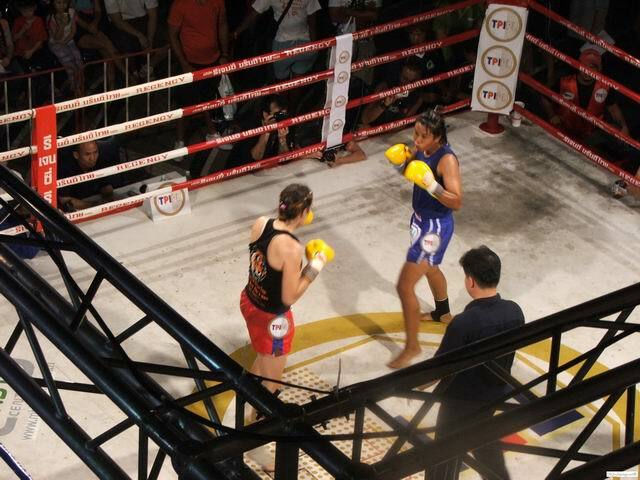 In one of the fights a girl from Luxembourg won against a local representative. At the end I managed to get a photo with one of the event promoters. After the fights I met my friend and we went to the Bed Supperclub for a new party. Again there were many people and we had nice chats and a lot of fun. On that day I decided to make a new tour around the local temples. Actually they are so many and it is difficult to see all the places of interest for a couple of days. But I made my best. I got a tuk-tuk cab. The driver tried again to take me around the city for some shopping, but I was prepared. 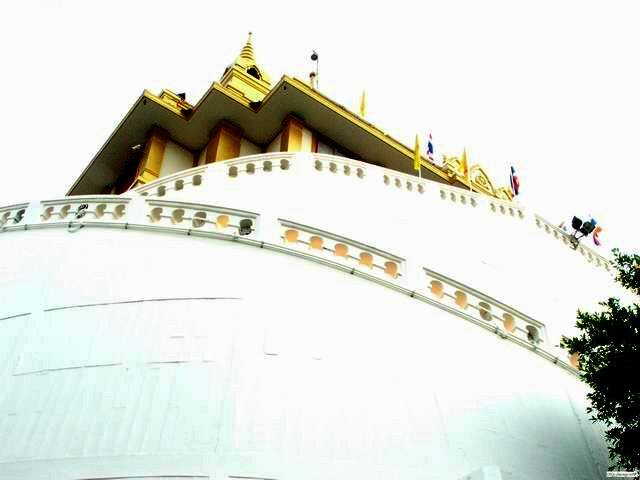 I said that I first wanted to see the Golden Mount temple and then we could discuss the rest of the journey. When we arrived there he tried to get 10 times the price for which we have negotiated, because I declined going to shops and Thai massage. But after a short conversation he was angry and he just left. I definitely was not ready to be driven once again like a monkey around the city. 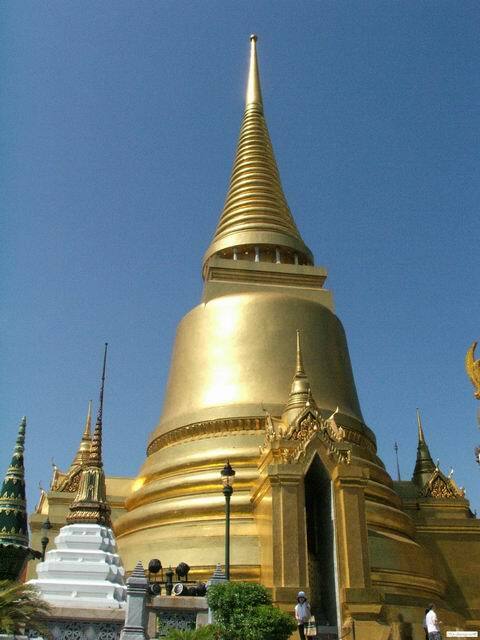 The Golden Mount is a really nice temple situated on a hill in the central part of Bangkok. When you climb to its top, you can have a perfect view. I made a lot of pictures from there. 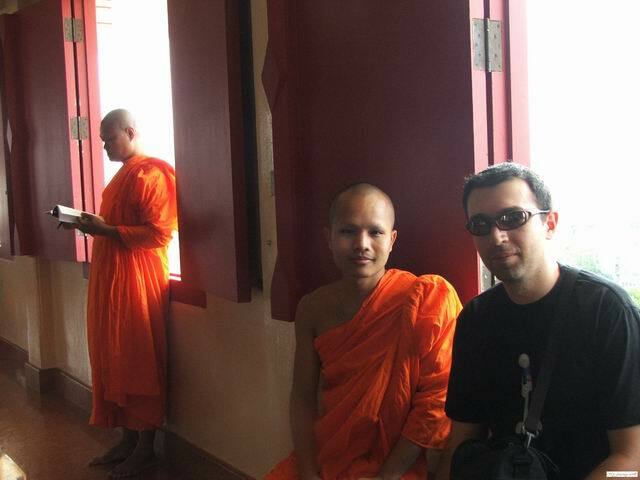 I even had one with a local monk. 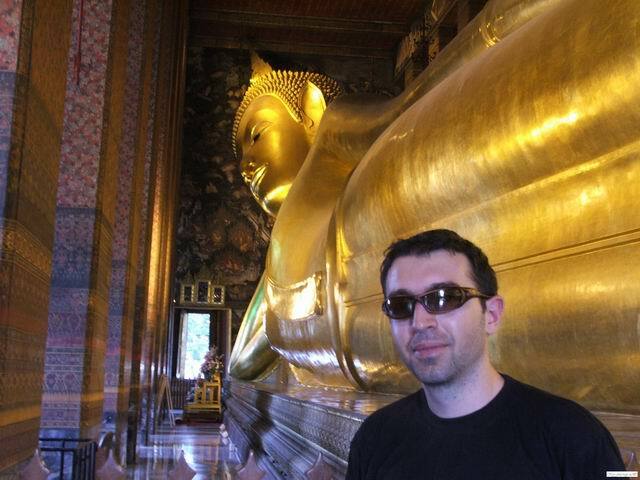 After 30 minutes I left the place and I walked towards the Wat Pho temple (The temple of the Reclining Buddha). 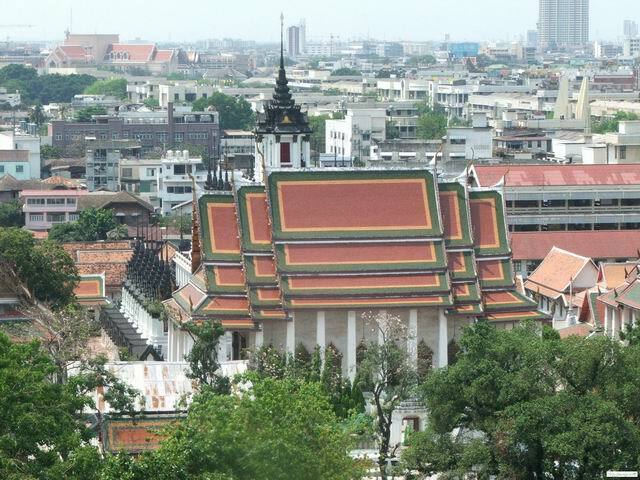 It is one of the oldest and biggest temples in Bangkok. 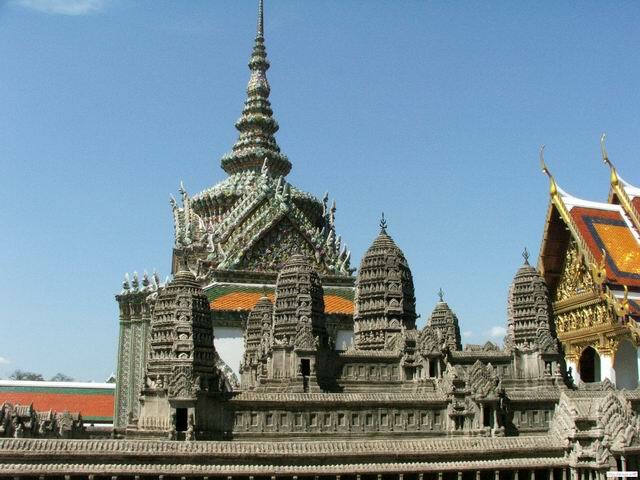 The temple complex contains over 100 different Buddha statues and some ruins from old Thailand capitals. 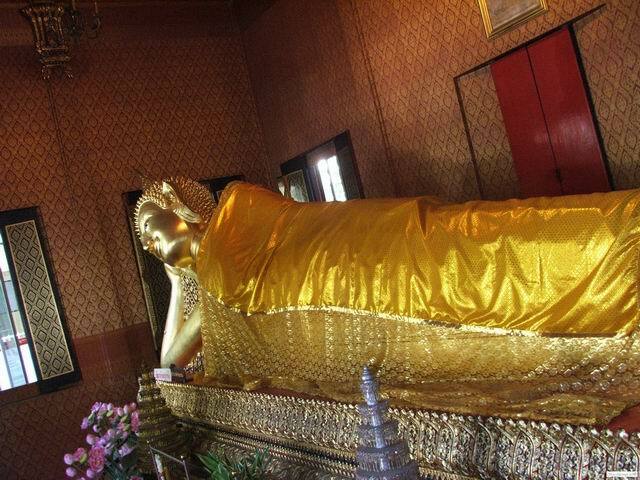 The most impressive is the statue of the Reclining Buddha. After spending some time in the complex I decided to check a park, which was situated near the temple. In front of the park a friendly local guy explained me some historical and economical facts about Thailand. One thing impresses me. He was so proud of his country and he tried to share this with the tourists. He explained about the Acer computers, old temples, sapphire and ruby mines. After the conversation I went in the park. It was so green and there were small lakes on its territory. After a small break I decided to walk towards the sky train station. 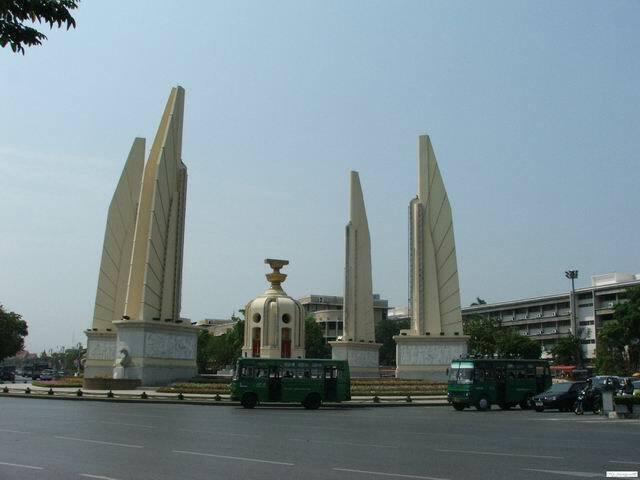 On my road I saw some more monuments like the Giant Swing and the Democracy monument. 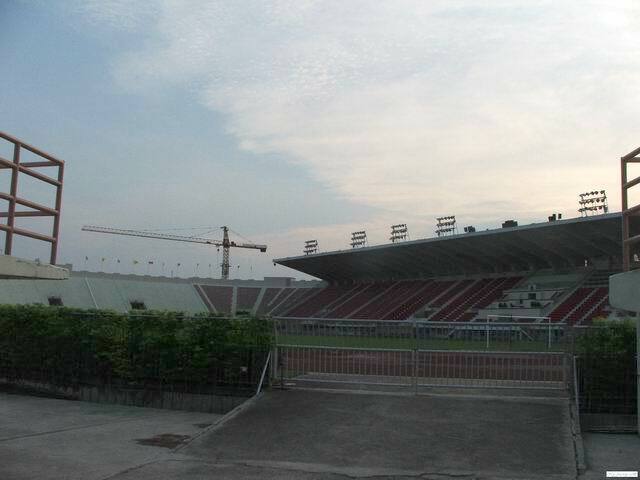 On my way back I also reached the National stadium. There I played a game which looked like hackee sack. 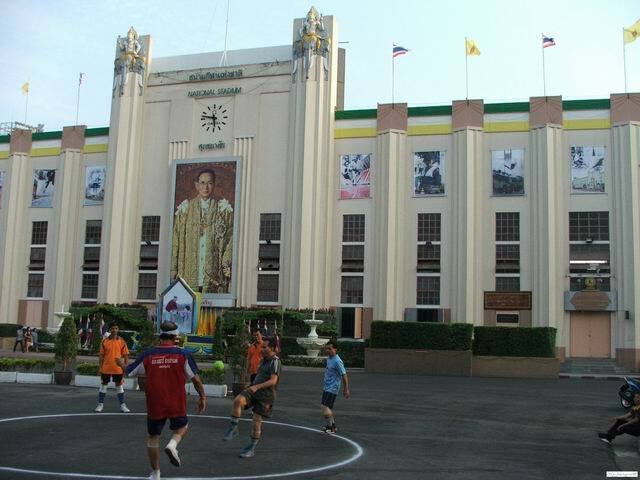 Its name was Sepak Takraw. The only difference was that the players were using a plastic ball. I played with the locals for half an hour. Although I used to play footbag a lot, I found this game more difficult, because the ball was really hard. However, the other players seemed to be very skillful. They made a lot of tricks. When I got back to the Andy’s place, he called me and said that he and his girlfriend would meet me in a restaurant near to his office. 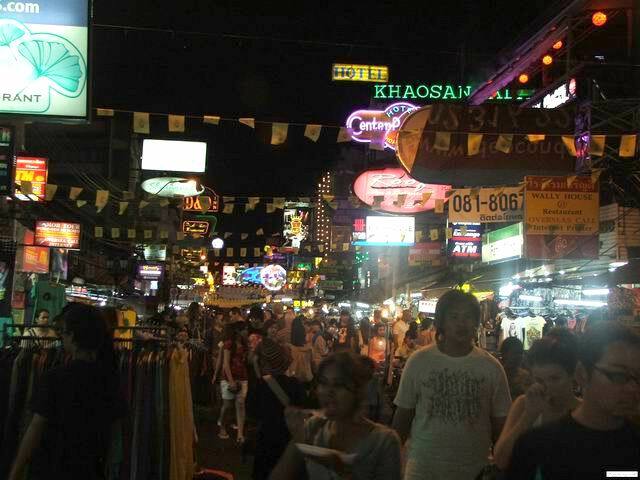 Then we went to the Khaosan street. 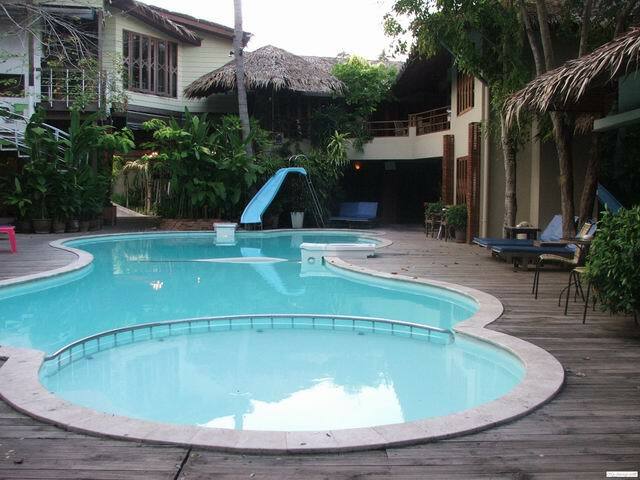 It is famous among the backpackers with the affordable hostels and bars. On this street Leonardo Di Caprio started his journey in the “The Beach” movie. 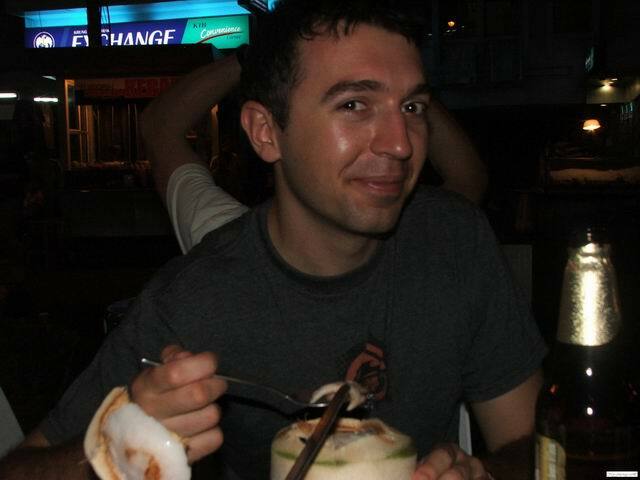 We had a nice dinner there, which ended with coconut milk. During the night the place was really overcrowded. 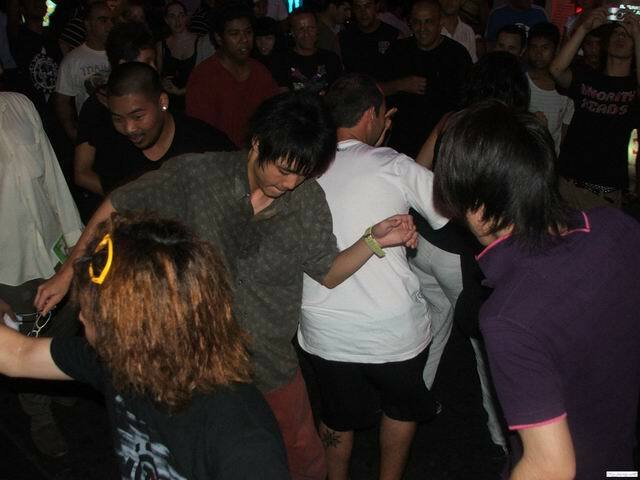 We saw many foreigners having fun. There were some spontaneous freestyle and break dance performances. 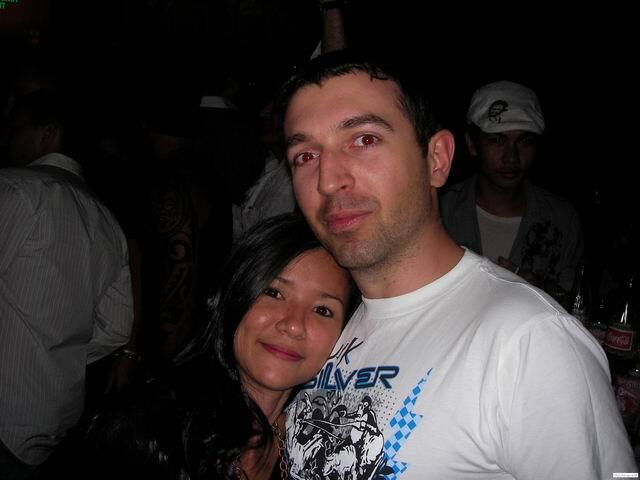 After some party we went to sleep, because we had an early flight on the next day to the Koh Samui island. Full with enthusiasm, we were waiting for our flight at the Suvarnabhumi airport in the Friday early morning. We had our tickets for the Bangkok Airlines flight from Bangkok to Koh Samui. The lobby of this company is quite cosy. You can enjoy refreshing drinks and some food while you are waiting. Thanks to an Andy’s friend, who was a flight captain, we were moved to the business class. During the flight we made some great photos including one in the plane’s cockpit. 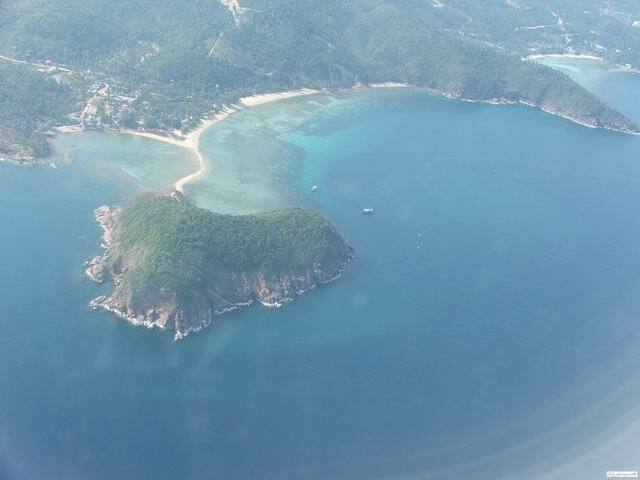 The pilots even flew low above one of the islands on the route to Koh Samui, so we managed to explore the surface from the sky. We landed on the most beautiful airport that I had ever seen. It was made mainly from wood and a big part of it was outside. 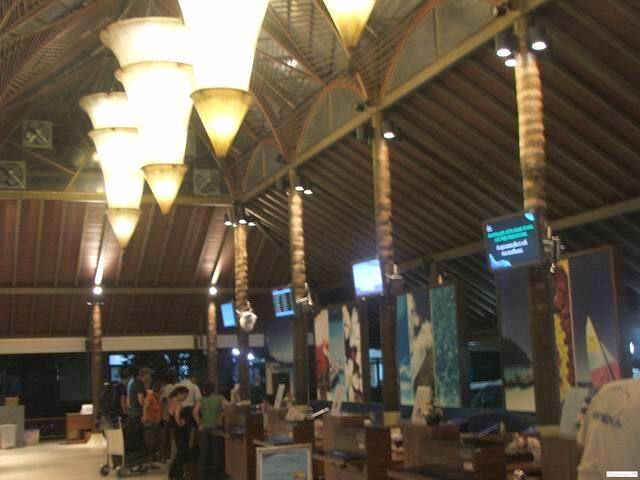 At 9:00 a.m we were already at the Tango Beach Resort, which is located at the Chaweng Beach. The rooms were really nice. We left our baggage and went to the Lazy Wave restaurant besides the bungalows. We had a breakfast and then we enjoyed a whole day long of laying at the beach and drinking Mai Tai cocktails. Around the lunch I decided to go for some diving at the near coral reef. I started swimming towards the reef. At the beginning there was a lot of seaweed, but after about 200 meters from the shore a whole new world appeared in front of me. 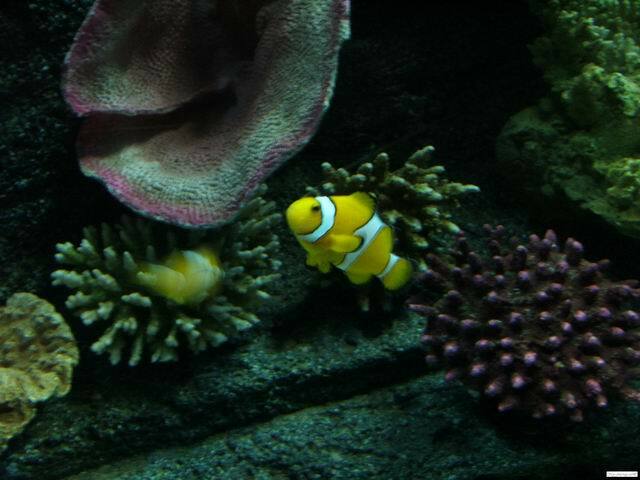 I reached the coral reef and I saw some of the marine creatures from the Siam Ocean World aquarium in their natural inhabitant. I spend a few hours exploring the reef. When I got back to the beach everybody were preparing for dinner. I took a shower and joined them. We had a wonderful dinner with a great variety of dishes. My favourite ones were the tiger and the king prawns with tamarind sauce. I also enjoyed some scallops and fried squids. 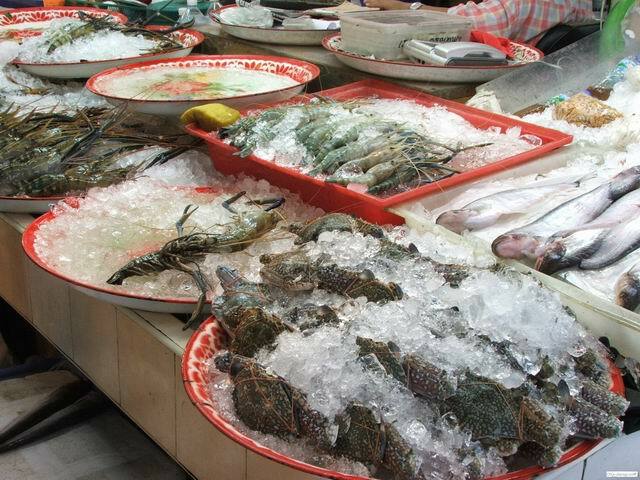 The best thing about the restaurant was that you could pick the fresh sea food from a stall and then the cook would prepare the dish for you. After a few hours of eating and having pleasant chats we were ready for a party. We went to the main street. There were many bars on each side of it. 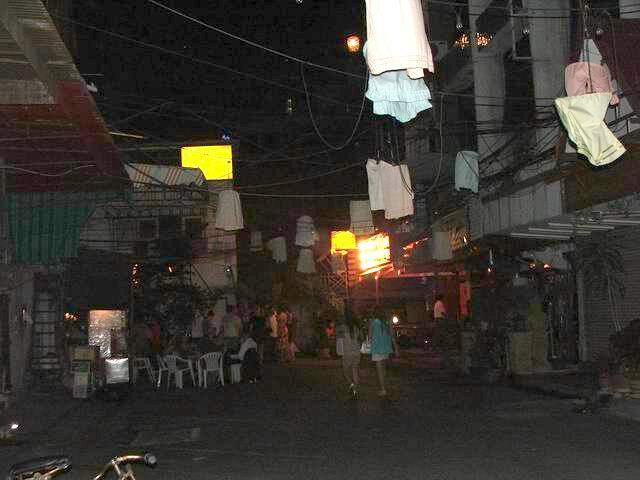 An enormous crowd of people was heading towards the local bars and discos. Actually I have newer been in Ibiza, but I guess that this place can be compared to it. There were so many different bars. The music was varied. In some bars I could hear reggae and hip-hop, while in others the DJs were playing trance, electro, break beat and house. Some of the bars were open till 2 a.m. and after this there were after party discos with big multimedia screens and foreign DJs. We had a lot of drinks and fun that night. We met people from all over the world. 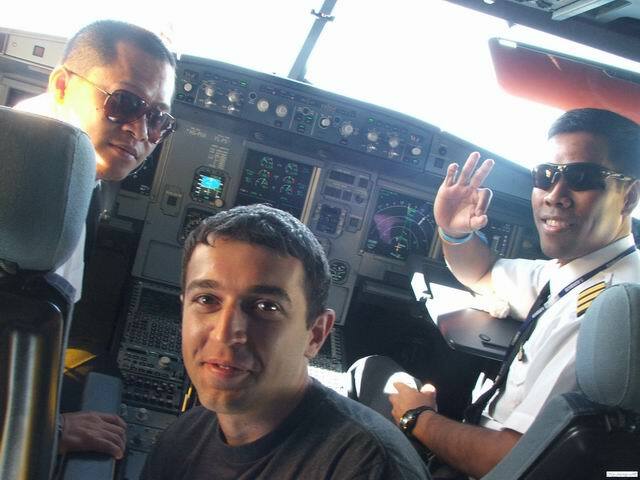 Me, Andy and our new friend the flight captain were the steadiest of the whole group. We continued dancing till 6 a.m. Then we had a nice walk on the beach towards our bungalows. This day was almost the same as the previous one. We had a pleasant breakfast and then we were laying on the beach. We made a lot of photos of the tropic paradise. I spent few more hours diving besides the reef. I even managed to reach another smaller island, but the water near its shore was full of seaweed, so I decided to go back to the reef. I saw different species. Some of them were really curios. They approached me without any fear. I felt so happy diving there. In the evening the guys from Finland and me were planing to watch the Manchester United game against Liverpool, but unfortunately there was a tropic storm. The electricity was turned off. We had once again a tasty dinner and after the rain stopped we went to party at the locals clubs. The bad thing about the tropic storms is that they do not end very fast. There was some more rain and power outages in most of the bars. Anyway, we managed to have enough fun moving from one bar to another. We were partying once again until the Sunday early morning. At the end there were just three of us, but this time Andy was replaced by Tapio, one of my new friends from Finland. The walking back home was not that pleasant because there was a river on the street caused by the rain. 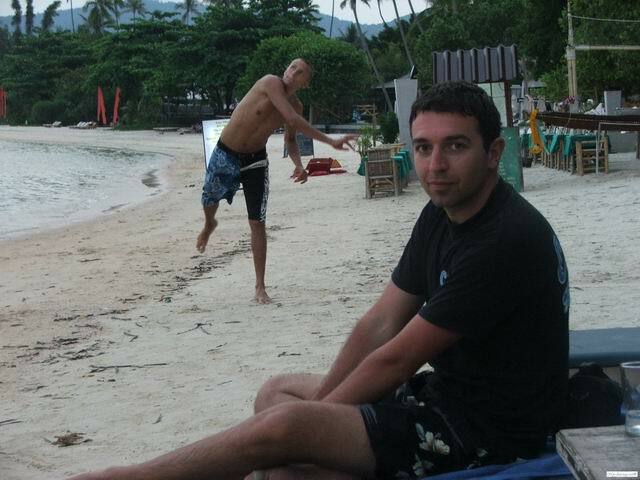 This was our last day at Samui, but we spent it in a similar way. 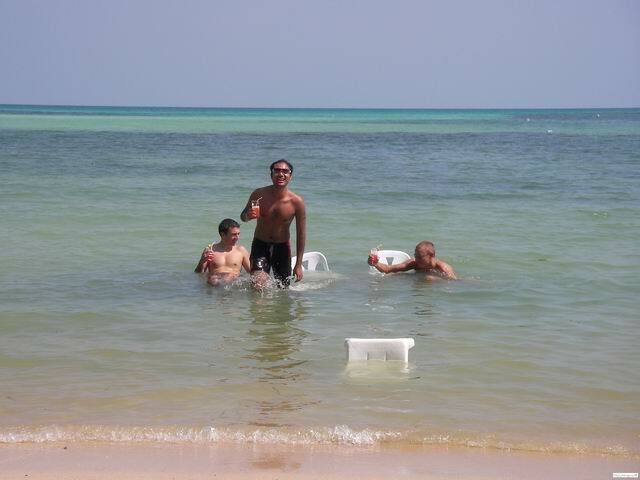 Again we were resting at the beach, playing some volleyball and rugby, photographing the nature and swimming in the sea. In the evening the storm started once again and we spent our time at the restaurant. We went to sleep at midnight, because we had to catch an early flight back to Bangkok. To be honest I was very sad to leave this paradise, that even the cosy airport could not improve my mood. 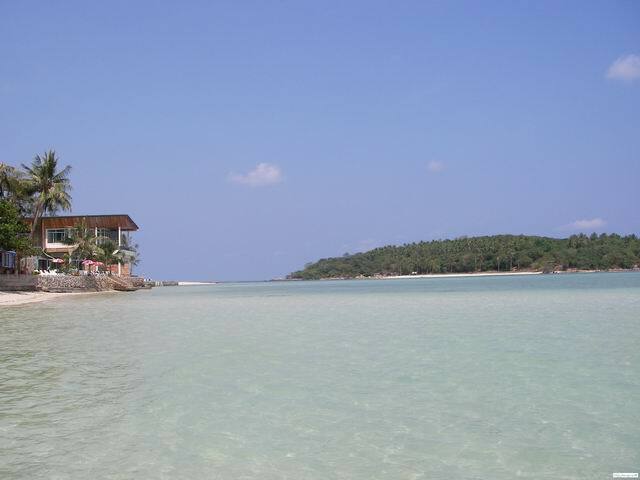 I hope that I will manage to come back some day and visit more Thailand islands. We arrived at Bangkok in the Monday early morning. We took a cab to the Andy’s place and I slept till the noon. Then I walked around the town, seeing more places of interest and having nice time. In the evening we visited some local entertainments . On Tuesday I spend most of my time in the malls shopping for me and my family. In the evening I prepared my baggage and left the Andy’s place. We had a delicious dinner an a fancy Japanese restaurant and then I took a cab to the airport. I had a really long flight home. It lasted about 27 hours. There were some issues and I had to change 4 planes. After Bangkok I landed in Amsterdam, Paris and Milano. 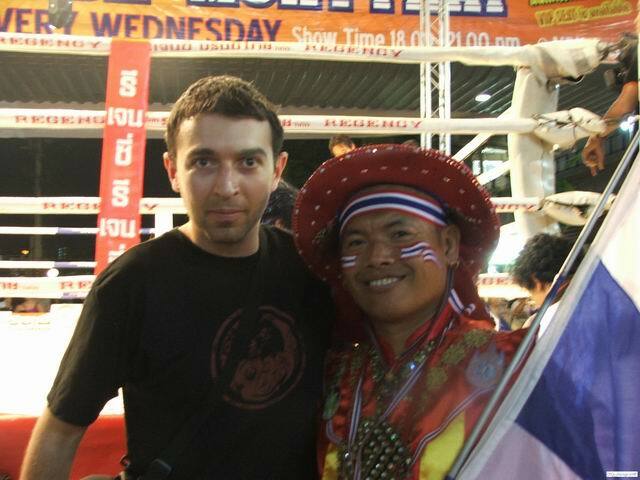 After two great weeks in Thailand I was once again in my home – Sofia, Bulgaria. 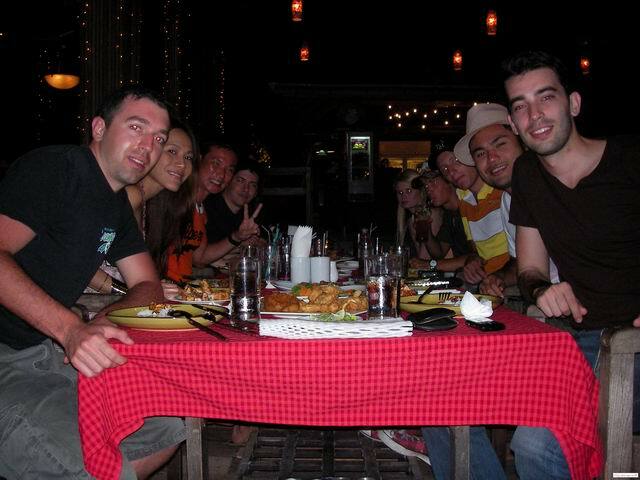 Here is the place to say Thanks to Andy and Isika for the wonderful time I had with them in Thailand. I wish them good luck with the model business. 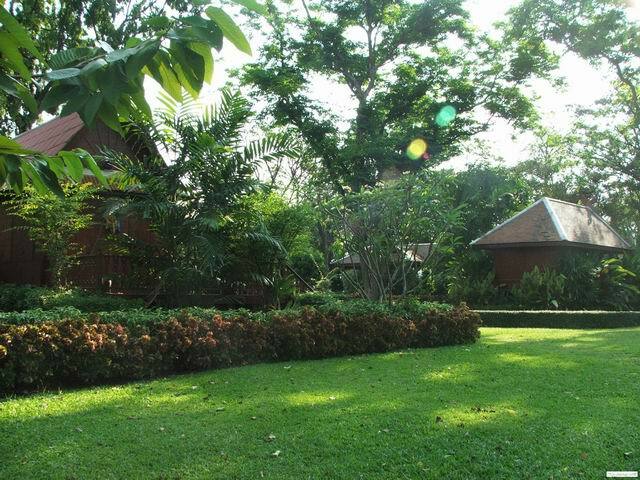 Very interesting articles about Samui Villa. Thanks very much admin ! I`ll definitely come again your blog. Keep up the good work !